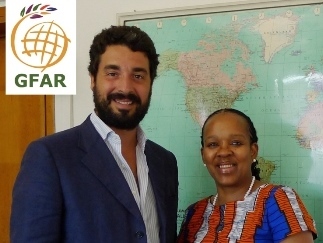 In January, GFAR Chair Bongiwe Njobe and GFAR Vice-Chair Raffaele Maiorano visited FAO Headquarters to meet with several Division Heads, FAO Strategic Programme leaders and Ms. M.H. Semedo, Deputy Director-General, Climate and Natural Resources. Their discussions provided opportunities to to find real, solid areas in which GFAR can complement FAO's many roles and where FAO's intergovernmental policy role can be informed by GFAR processes and actions. Mr Ren Wang, who represents FAO on the GFAR Executive Committee, received Ms Njobe and Mr Maiorano and facilitated their engagements. Ms Semedo, in her capacity as AGD-AG in FAO overseeing GFAR Secretariat within FAO and in the GFAR Executive Committee, noted that GFAR's four key focus areas are compatible with FAO's work, as they align with the to a great extent with the Strategic Programmes. Mr Wang recognized the great value of GFAR as a unique mechanism having "much to offer FAO in providing an inclusive mechanism for dialogue and collective actions with the private sector, civil society and public sector agencies". 1) Work of a FAO Task Force organizing the 2nd Agroecology Symposium scheduled for April 2018. GFAR participation will ensure balanced participation of farmers and the private sector in the Symposium as well as the proposed "Scaling Up Agroecology" Initiative. GFAR Secretariat will also support awareness-raising and pre-discussion for the Agroecology Symposium through a Twitter Chat around key questions related to agroecology and scaling up to achieve the Sustainable Development Goals. 2) Organization of the first FAO Innovation Symposium to be held in late November 2018, ensuring GFAR's direct engagement in planning and outreach and its anticipated follow through into transforming and strengthening national innovation systems. 3) Aligning work at national level and in national frameworks, particularly linked to programmes such as FIRST, GIAHS, the Forest and Farm Facility and KORE.